Randy Pausch American professor - Randolph Frederick “Randy” Pausch was born on 23 October 1960 in Baltimore, Maryland. Randy Pausch was an American professor of Computer Science, human –computer interaction and design at Carnegie Mellon University in Pittsburgh, Pennsylvania. Randy Pausch was died with pancreatic cancer on 25 July 2008.He gave last lecture on September 18, 2007, lecture titled is “The Last Lecture: Really Achieving your childhood Dreams” at Carnegie Mellon. Randy Pausch last speech became a more popular you tube video and New York best-selling book. Randy Pausch grew up in Columbia, Maryland. Fred Pausch and Virginia Pausch are the parents of Randy Pausch and he had one sibling, Tammy. Randy Pausch was a lawyer and insurance company executive and his mother taught English. He completed his graduation in 1978 from Oakland Mills High School in Columbia, Maryland. 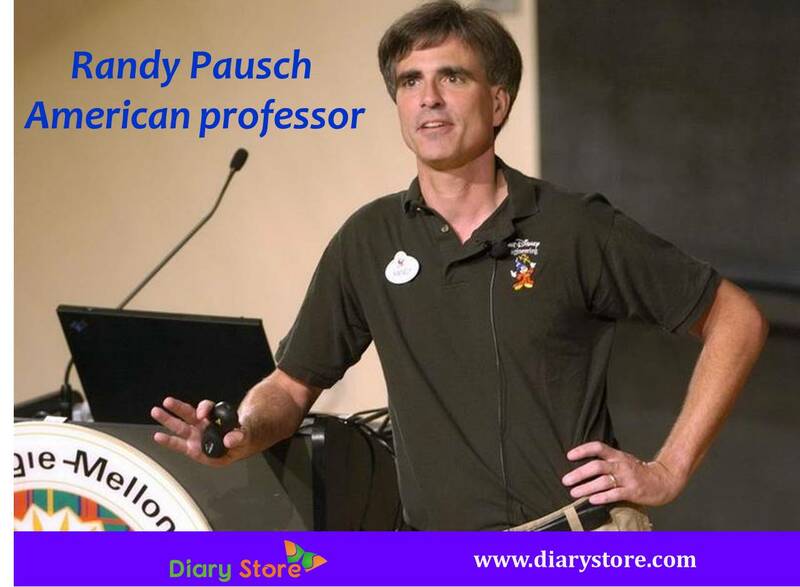 Randys Pausch received his bachelor’s degree in computer science from Brown University in Providence, Rhode Island in 1978.Randy Pausch completed his Ph.D. in computer science in August 1988 from Carnegie Mellon University. Randy Pausch became a professor of computer science, Human-computer Interaction and Design at Carnegie Mellon University in May, 1982. Dr Pausch worked at university of Virginia in the computer science department from 1988 to 1997.Randy Pausch co-found Carnegie Mellon University’s Entertainment Technology Center to teach students interdisciplinary skills in design, technology and art. Randy Pausch also acted as a consultant to companies like PARC, Media Metrix and Google. He also a Author, he written 70 articles and author of five books. In mid-2006 Randy Pausch was diagnosed with pancreatic cancer. On 18 September, 2007 Randy Pausch gave “The Last Lecture: Really achieving your Childhood Dreams “at Carnegie Mellon. “The Last Lecture”, which he co-wrote with Jeffrey Zaslow of the Wall Street Journal. Book has been translated into 48 languages and it was a New York Times best seller in 2008. Randy Pausch married Jai Glasgow in May 2000. Randy Pausch had three children Logan, Dylan and Chloe. Randy Pausch died from pancreatic cancer on 25 July, 2008 at the age of 47. Randy Paunchy also inducted as a Fellow of the Association for Computing Machinery. In 2007, Randy Pausch win prestigious Karl V.Karlstrom outstanding Educator award and he also received the Association for computing Machinery special interest group on Computer Science Education Award for outstanding contributions to Computer Science Education. “Experience is what you get when you didn't get what you wanted. And experience is often the most valuable thing you have to offer. “The key question to keep asking is, Are you spending your time on the right things? Because time is all you have”. “No job is beneath you.